INK YOUR OWN. Designed to help you explore your self-expression. These bold classic symbols, good luck charms, and inherently beautiful tattoos will deepen your mana (spirit), inspire your passion, freedom, and balance in your life. CREATE AND ENJOY. Tattoos are the best way to express yourself by showing the world who you are. 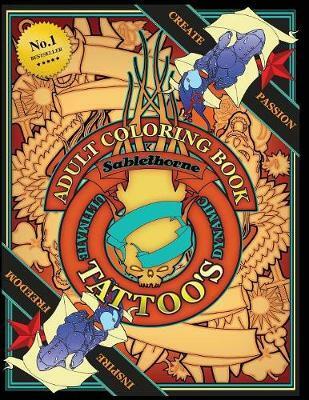 If you have tattoos or just an admirer, this tattoo coloring book will be perfect for you. With an array of designs influenced by tattoos, you will practically feel like a tattoo artist yourself. You won't be bored with the designs that span mermaids, fire, hearts, dragons, and so much more! There's no better way to de-stress than by coloring all your stress away. Even if you aren't stressed, this adult coloring book will provide hours of entertainment, and you will be sad when you finish coloring the last page. This would be the perfect gift for any tattoo or art lover. It will spark creativity in anyone in a drawing or painting slump. It's something unique for that friend that you know has a ton of adult coloring books, and it's fun for someone who's just getting into adult coloring books. Who knows, maybe you will love one of the designs that you color so much that you want it tattooed onto yourself!